Radishes are the biggest reward for all the hard work it takes to start the garden. I use the seeds to mark rows of slower growing vegetables, and soon we are overrun with spicy radishes that need to be eaten. 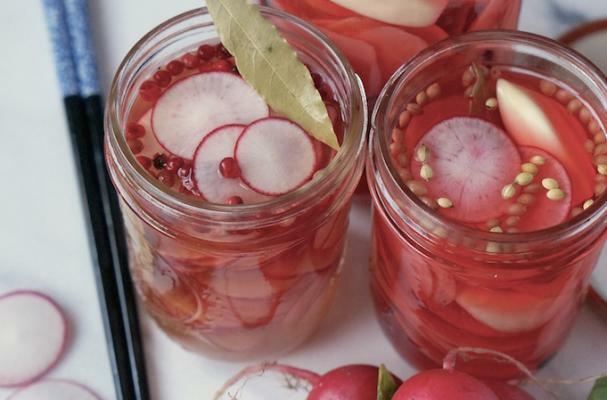 They make a quick and easy pickled treat that the whole family loves, and we found one recipe that was different from anything in our recipe box. Thanks to recipe contributor Audrey Shiu, these are the new fan favorite in our kitchens. 1 Add vinegar, salt and sugar to a mixing bowl. Stir until dissolved. 2 Slice the radishes into 1/16-inch thick slices.